Consumers are advised through many channels to check their credit report at least once per year. The reason? Mistakes can appear. Mistakes that can depress credit scores and keep someone from obtaining a home loan when they need it. Sometimes people applying for a home loan are disputing credit during the mortgage process. Unfortunately, mistakes appearing on these reports are relatively common and when bad information is placed in a file it can sit there without the consumer knowing about it. When a loan application is ultimately submitted it can be a surprise to be turned down when applying for a mortgage. Someone can pay their bills on time, every time and think their credit is nothing short of pristine only to discover it’s nothing near through no fault of their own. And when a mistake is found and a dispute filed before or during the mortgage application process it can derail the application altogether, even if the dispute is a legitimate one. The credit reporting process does involve multiple parties and for this reason, mistakes can be placed in a file and it can be hard to track down the culprit. There are three major credit repositories, Equifax, Experian and TransUnion. When a business accepts a credit application the merchant requests a credit history and credit scores from each of the three repositories. The scores are three-digit numbers ranging from 300 to 850 with the higher number representing better profile. There are five factors that make up the algorithm with the two most important being someone’s payment history and account balances. Just these two account for nearly two-thirds of an individual’s total score. When the scores are returned, almost instantaneously after the initial request, they will be similar but very rarely exactly the same. For instance, the scores might come back as 745, 738 and 741. Why are the scores similar but usually different? One of the reasons depends upon when the individual merchant reports payment histories to the three bureaus. Or a business only subscribes to just one of the bureaus and not all three. Or a business only updates payment patterns once per month while another twice on the 15th and 30th. For instance, a consumer gets a bonus from his employer and decides to pay off a $5,000 credit card balance. Thinking that will automatically improve his overall profile, he applies for a car loan. 10 days later the finance company tells him while he’s approved for an automobile loan but he can’t get the best rate because his credit card is maxed out at $5,000. Of course, the consumer knows the balance is now zero but because the company hasn’t reported it to any of the three bureaus, it still shows a credit card balance at its limit. 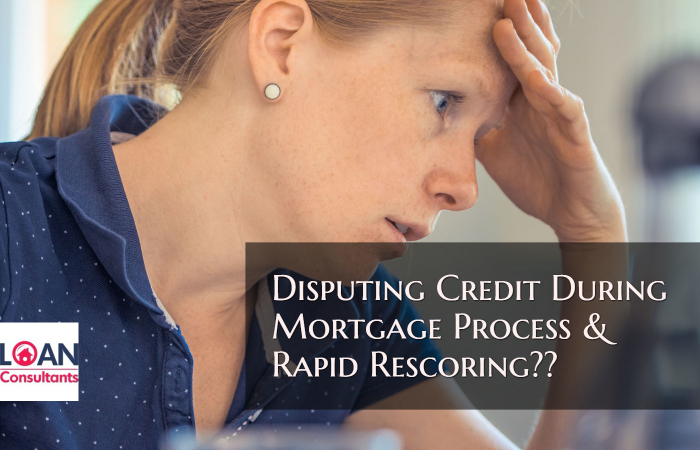 This could be a major issue when disputing credit during the mortgage process. There are indeed differences between reporting periods and mistakes. When there are mistakes, the consumer has the opportunity to correct the bad information and the reason consumers should check their history regularly. What sort of mistakes are the most common? One common error found on credit reports involves someone else’s credit appearing on your report. Robert Smith applies for credit and finds an outstanding collection account that doesn’t belong to him it could very well belong to Bob Smith, Jr. or Bobby Smith, III or something similar. Common names can confuse credit bureaus. Or, someone is divorced and the ex-spouse’s personal credit information keeps showing up on a report and damaging scores. When there is a mistake, consumers have the right to disagree with this information and get the offending data removed. To file an official dispute, the consumer must provide documentation of the error. For instance, an old card balance still shows an $8,000 outstanding amount that’s over a year old. The consumer provides copies of the final statement showing the zero balance and a letter stating the credit card was canceled on the consumer’s behalf. Bureaus then have 30 days in which to respond and when a dispute is filed the bureaus contact the merchant for verification. Once the zero balance is confirmed, the bad information is removed. If consumers dispute the information with just one of the bureaus, it’s required the other two be updated regarding the new information but all too often that doesn’t happen. Instead of disputing directly with the credit bureau or merchant, it’s easier to have the correction made by your mortgage company. Mortgage lenders have working relationships with credit reporting agencies. These agencies have customer service representatives who make sales calls to mortgage lenders and help out when issues arise. Instead of going through the 30 day process of contacting say TransUnion directly about an account that doesn’t belong to you, ask your loan officer to take care of it for you. In many cases, the mistake is fixed within 24 hours. You just need to provide any documentation you have to prove your position. Now let’s take it a step further and see what happens when a mortgage lender accepts a mortgage application, pulls a credit report and sees that a trade line has the official term “In Dispute” next to it. What happens? Unfortunately, the lender doesn’t just ignore the trade line because the applicant disagrees with what appears but just the opposite- the lender wants it settled before moving forward. Why? One of the main factors, when lenders review an application, is to determine affordability by comparing monthly credit obligations with gross monthly income. If an account is in dispute, the lender has no way of knowing when it will be settled and in whose favor. If the consumer loses the argument and is forced to pay off the outstanding balance that could affect the borrowers’ ability to repay the new mortgage. The lender will require the issue to be settled in some fashion. For contesting an account of at least $1,000 or more, it will need to be either paid off entirely or at a minimum the creditor stating the account has been settled. The phrase “account in dispute” must be changed on the credit report to read “not in dispute.” For account balances less than $1,000 while the account may not need to be paid off entirely the creditor must still report the account is no longer a problem. Disputing credit during the mortgage process it takes more like 2-3 weeks. For some bureaus, it can take over a month to show an improvement on your credit report. It’s unfortunate that consumers are forced to fix a mistake they didn’t create when it comes to bad information on a report but it’s important to remember the three repositories only report what is presented to them. When merchants report payment histories using Bobby Smith instead of Robert Smith the data might very well end up in the wrong place and because there are so many involved in reporting and requesting payment patterns it’s easy to see that a mistake might be found. Mortgage lenders take disputed credit items rather seriously and while it’s important to get mistakes appearing on your credit report fixed it’s also important to know the impact of a disputed account. If you know you’re soon to be applying for a home loan and you discover there is some bad information appearing on your credit report it’s better to let your loan officer help out. Your loan officer can walk you through the process on how to get mistakes fixed and have those items removed at the outset without you having to deal with the bureaucracies of three giant credit repositories on your own. If you have been turned down for a home loan or have any questions about real estate or mortgage please contact Matt Herbolich, MBA, JD, LLM by phone or text at 786.390.9499, or by email at mherbolich@usa-mortgage.com. Mr Herbolich works when you work, so contact him anytime.